It's nearing 6 am and I'm already wide awake. The sun rises earlier here. As "orang Semenanjung", I've bemoaned the fact that we gave East Malaysia an extra hour when we set our clocks forward in 1963 to create a single timezone for our new country . But that's probably the biggest thing the federal government has given Sabah and Sarawak, supposedly equal partners in our federation of states, and with special privileges such as control over their borders. Putrajaya (or Kuala Lumpur back then) has taken back multi-billions in dues. Petroleum, which some say is the mainstay buoying up our economy, is only one natural resource we enjoy from the East. There is an immense amount of logging going on here in Borneo which anyone going on Google Earth can witness. The destruction of our rainforest is a well known horror that Malaysians have come to acknowledge as an everyday reality. Even the native peoples may have accepted that the greedy state and federal governments will keep granting logging concessions to wealthy tycoons and that some degree of illegal logging will continue. After all, it's those same logging roads bringing out thousands of trees every day that often provide the only access to amenities in town. Healthcare, diesel fuel, education, and goods other than the produce they are able to grow (provided they have not been robbed of their native lands). Schools have inched a little closer. 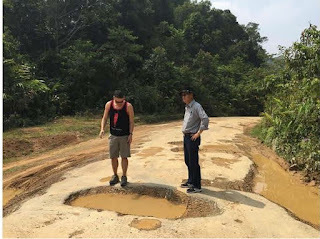 To get into the interior villages from the nearest town, there are 4WDs now, if you want to brave the 3 to 7 to 12 hour drives on dirt roads or half-heartedly tarred roads that contain more potholes than road. It really depends where you want to go, or come out from. And how the roads are faring. Generally, good roads means elections are either on the horizon or have just recently taken place. Major projects to upgrade access and facilities are a reliable signpost for elections. At the very least, one gets an upgrade every 5 years. The journey into interior villages is not an easy one, particularly with battered pathways that are more potholes than actual road. A normal journey of an hour and a half could get doubled into three, four, and longer depending on how bad the conditions of disrepair they fall into. 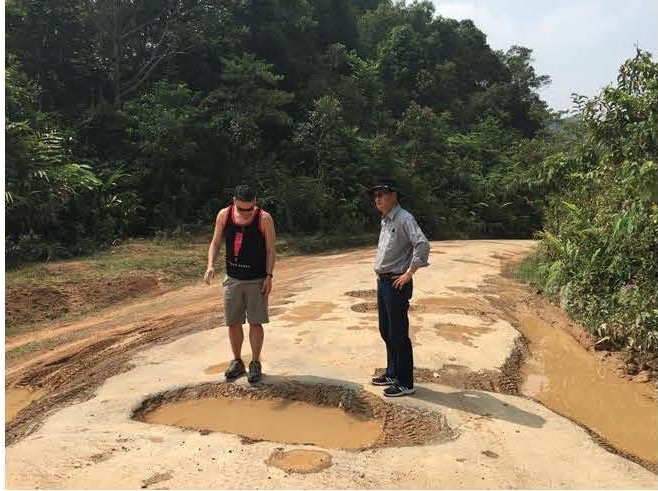 The poor condition of roads means that it is limited and expensive to access the nearest town for supplies and trade of produce, and to communicate with other related villages. Phone coverage is also extremely limited at this time. And then there are the projects that have been promised but never materialised. Again, it really depends on where you find yourself. The interior covers thousands of square kilometres, and I visited a section of it as an observer. 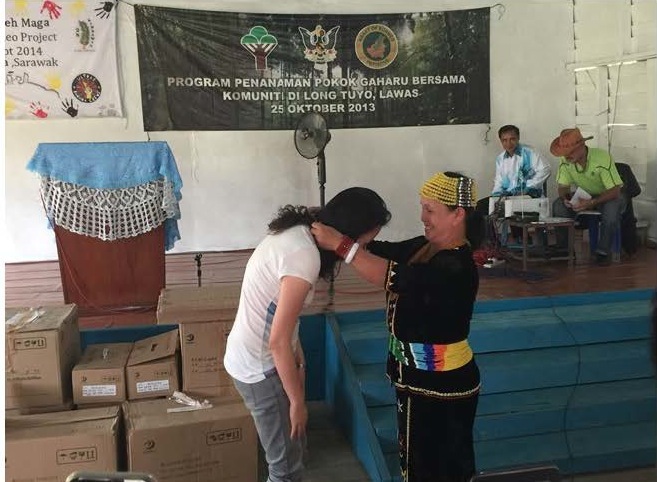 Our objective was to bring solar powered battery units and lamps to the area of Ba'kelalan, which constitutes about 20 villages, each with between over a hundred to 900 inhabitants. 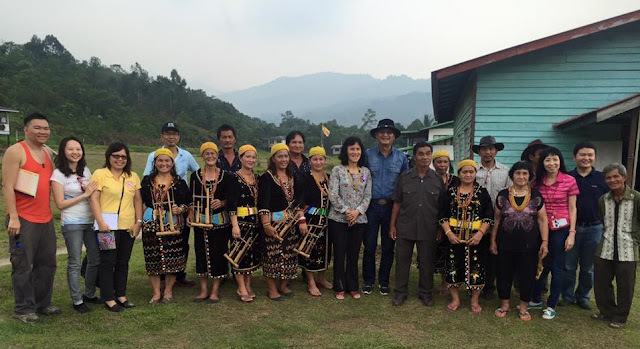 A particularly intelligent people with a fascinating history, some of the Lun Bawang natives have risen up to defend their rights. One such leader was the impetus for my trip into the interior - Baru Bian, the state assemblyman for N70, Ba'kelalan. A native son of the Lawas highlands, he was one of those that walked 3 days journey to the nearest boarding school, spending shorter holidays on site. Anything less than a fortnight's break wasn't worth the journey home on foot. His book 'A Long Awakening' contains delightful, inspiring and sometimes heartbreaking details of his life and that of his people. Baru is more than a people's representative, however. A lawyer who conducts Native Customary Rights (NCR) cases amongst other civil suits, he advises his own tribe and others on how to deal with the numerous incursions from loggers and government surveyors attempting to encroach upon native land. 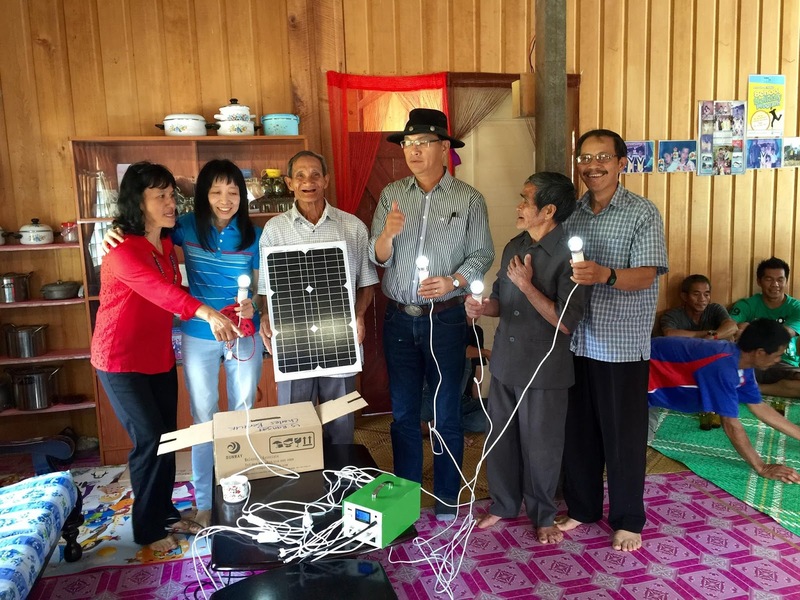 I was invited on this trip by associates of Baru Bian, to witness the distribution of basic solar-powered lighting to 8 villages. The funds for this round were contributed exclusively by individuals who wanted to donate for the improvement of infrastructure in the interior. Due to an abandoned order, the solar unit manufacturer was able to offer us heavy discounts on the 200 solar lamps we ordered. 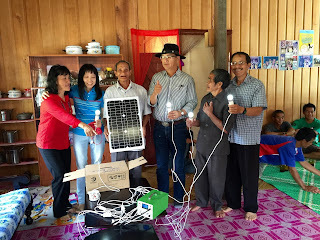 Baru and his wife Cheng Siew decided to raise money from those who wanted to make a tangible impact on Ba'kelalan, and we were able to distribute solar units (one per household) to up to 8 villages this time: Puneng Berayong, Berayung Tengah, Long Tuyo&Tang Pau, Long Rangat, Long Luping, Long Namut@Long Rereku and Long Meringau. Why these 8? Ba'kelalan is a constituency consistent of several thousand residents. Last year, 8 other villages were "lit up" using mini-hydro dams. These are nothing like the massive dams we usually read about in the papers. Bakun, Baram. Those mega-dams flood thousands of hectares of arable land, eroding the landscape, destroying viable farmlands and wiping out rare flora and fauna life. A mini-hydro is as simple as finding a strong (but not necessarily large) water source, installing a turbine generator powered by this natural kinetic energy, and then pulling electricity cables to the village. Some of these could stretch for kilometres, and become less practical the further away the water source is located. With mini-hydros, there is practically no disruption to the natural way of life, and villagers have additional facilities most of us take for granted as bare minimum - an energy-saver LED bulb in each room, radio/tv for news provided reception is available, fans for hot days and warm nights. However, without an appropriate water source, mini-hydros are not viable power generators. The alternative? Solar power - and in this case, a set consisting of (i) one solar panel; (ii) a battery; (iii) 4 high quality LED bulbs with long wiring, and (iv) a USB out cable for charging up devices. 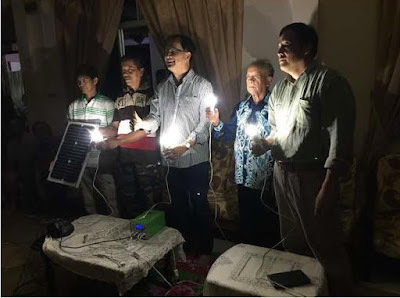 The residents of each kampung we visited were delighted to receive these gifts, which would mean saving on diesel generators for basic lighting. Their own resourceful, quick-witted nature meant that we hardly needed to provide any technical assistance but for a quick demo during each handover ceremony. These are humble, hardworking folk, who will welcome you into their homes as honoured guests. Their big hearts matched by shy smiles, at every stop, we were served sweet tea in their best teacups and many varieties of Lun Bawang kuih. They hunted wild boar in the nights before we came, and caught river fish that would sell for RM350 per kilo in the city. There were generous pots of delicious boiled rice (several types, including mixed in with vegetables and/or meat), leafy greens, mashed pumpkin, bowls laden with two or three types of soup, and bottled water for our delicate stomachs. They gave us gifts: beautiful beaded necklaces, handmade pressed-straw cowboy hats, bags of rice and salt, unfried keropok to take home. People queued patiently in neat lines to shake our hands, thanking us so often and so much, it was embarrassing to think of what little I had done. My auntie, who has lived in Sarawak for over 30 years, lent me a friendly caution: "these people will adopt you and make you one of them!" They gave us their best - food, rooms, love. And were still abashed at what they deemed modest fare. My short stay was sufficient to grant me a deep respect for their humility and resilience. about the challenges faced by the people of Ba'kelalan, and my friend wondered, "Would it have been better if no one had ever 'discovered' the interior villages, and left them alone?" For me, and for Baru, the answer is, "Not necessarily". When villagers are very sick and need hospitals or advanced care, then accessibility to better-equipped towns and cities can be literally lifesaving. Education enhances the potential of villagers to support themselves better, to defend their rights as they realise that unbeknownst to them, The Powers That Be are muddying their clean rivers, signing over their land to the highest bidder, and amending legislation that affects their current livelihood, as well their future generations. Good roads and more efficient transportation mean the ability to trade sustainably-grown produce for cash to buy, e.g. solar lamps, medicines, books, water pipes and upgraded technology that can ease the natural hardships of the interior. These aren't luxuries but enhancements to a beautiful, self-sufficient way of life. A life which they freely demonstrate to us, of tending to the land God has entrusted to us. As we were leaving one village, one resident smiled widely at me. He grasped my hand and said "Terima kasih kerana mengingati kami." Thank you for remembering us. No, Ba'kelalan. Thank you for showing me how to be responsible for that which is under my care, and for reminding me what community means. Let's now work to protect and preserve what remains of yours.